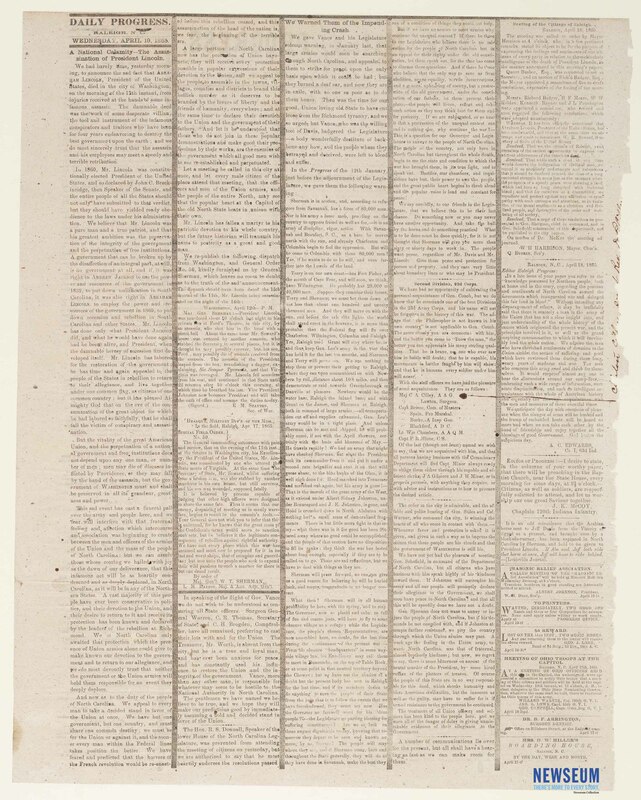 The Daily Progress was published in Raleigh, North Carolina, which was occupied by the Union Army at the time this issue was printed. An interior page contains an editorial titled "A National Calamity - the Assassination of President Lincoln" which laments the death of President Abraham Lincoln and encourages citizens of North Carolina to pledge their allegiance to the Union. The paper also prints a dispatch from Secretary of War Edwin M. Stanton to Major General W.T. Sherman relaying the news of Lincoln's death, as well as Sherman's Special Field Order No. 50 relaying the same. Known as "mourning rules," the wide vertical lines between the newspaper columns represent grief over the loss of an important person.